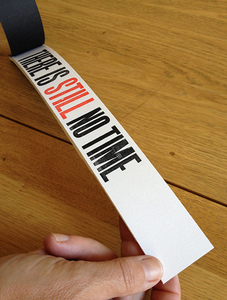 A limited edition artists' book which is a sequel to the publication There is no time. This book highlights responses from an all-male audience who were asked to consider and reflect upon all the small things in life that we fail to find time for. The pages of the book get incrementally smaller to suggest the passing of time. This artefact has been purchased by Oxford Brookes University library for their Artists' Book Collection.